This week in Santa Cruz, CA - a Coastal California town near where I live - a wild mountain lion was roaming around in the downtown area near a local river. The mountain lion got trapped in the concrete-sided aquaduct, was tranquilized and safely returned to the wild, as it should be. 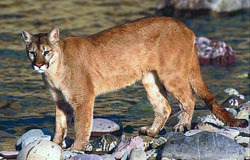 Of course you would be concerned about the safety of your own domestic cats, if a mountain lion sauntered into your own neighborhood. One of the local witnesses said her cats came inside on their own when the mountain lion was in the area. Smart cats, but if you have outside-only cats, they could be threatened by a wild predator like this. A possible solution to a threat like this is a secure outdoor enclosure for your outdoor cats which can protect them and still afford them the outdoor experience. Materials for such a structure can be obtained at local hardware stores and is fairly inexpensive. Commercial products specifically designed to protect small pets from larger predators in urban and some rural areas are available, but can be much more costly. Our cats are indoor-outdoor cats. We have designated an outdoor area for them which is both cat-proof and predator-proof. It protects them from local predators, it prevents them getting into scuffles with neighbor cats and the local scavenger population (skunks, raccoons, etc), protects them from street accidents, and gives them a place to go "be cats" as they run around, eat grass and play. The main protective structure is components from a portable dog kennel which we purchased online. The entire "cage" is modular so parts can be reconfigured for different arrangements. It is very sturdy, long-lasting and not bad-looking. 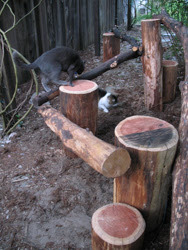 We have equipped the enclosure with cat-friendly items like high shelves, and a large "scratch tree" which is made from stumps and large branches. Our "cat run" is very effective and practical. Nothing is permanently installed or constructed so it can be moved, reconfigured, enlarged, etc. 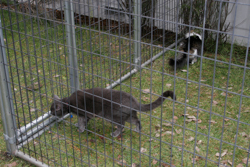 We have employed a number of other "cat fence-in" products in the area to keep our cats inside the area and keep other cats and small critters out, but people can come and go as needed. I highly recommend folks with cats (and other small pets) to consider this kind of protective solution if you at all concerned about large predators in your area. Of course you will gain all the other benefits as well, and your pet(s) will be happy and safe. As always, I am happy to answer questions and would certainly enjoy the opportunity to help you make your household safer for your cat.